After a shaky start, the New York Yankees have pulled themselves together to become the team to watch this season. Many are now naming them as favorites to win the World Series. Certainly, they’ve played some spectacular games over the last couple of months, but can the Yankees keep their current form and go on to achieve the triumph many are hoping for? In 2017, the Yankees finished one game short of the World Series, and fans and commentators all had high expectations for the team in 2018. The offseason period saw them bringing in a new manager in the shape of Aaron Boone, and a few notable acquisitions saw 2017 NL MVP superstar Giancarlo Stanton brought in from the Miami Marlins, while Neil Walker and Brandon Drury arrived at second and third base respectively. Many were surprised and disappointed when the Yankees began the 2018 season so badly. A run of injuries and lost games saw the New York team singularly failing to live up to the hype, but then incredibly, it all turned around. April 21st was the beginning of a nine-game winning streak, and since then, they’ve continued to sweep all before them, beating some of the most formidable teams in the league. As a result, the Yankees’ odds have improved dramatically, with some bookmakers now naming them as favorites to win the World Series. This puts them ahead of defending champions and previous favorites the Houston Astros, and third place contenders The Boston Red Sox. 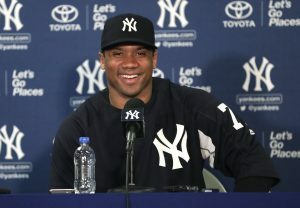 However, to achieve the results expected, the Yankees need to maintain their current form without becoming complacent. There’s still a long way to go. The secret of the Yankees’ success so far is that the team is not reliant on just a few star players. This means that they are resilient to injuries and have enough depth to overcome a particular player going on the disabled list or simply hitting a bad patch. In that initial winning streak, Aaron Judge, Didi Gregorius and Miguel Andujar all stepped up to deliver home runs, with Andujar becoming only the third player in Yankees history to hit a seven-game extra-base hit streak before the age of 24, after Mickey Mantle and Joe DiMaggio. Tyler Austin and Neil Walker seem to cover for each other; when one is off-form the other is soaring, and vice versa. When Jordan Montgomery found himself on the disabled list for ten days with an elbow strain, relief pitcher Domingo German filled in brilliantly. If improvements still need to be made, then perhaps getting another good, reliable starting pitcher would be one. They’ve been doing well so far, but they need to stay consistent, and the likes of Sonny Gray and Masahiro Tanaka are just too erratic. Mention should also be made of course of Gleyber Torres, whose performance this season has surely inspired the whole team, giving the Yankees a swaggering confidence that’s hard to beat. Nevertheless, it’s about the team, not just individual players, and if the Yankees are going to win the World Series, it will be a team effort that does so.